“The Post” is built around the Pentagon Papers, a secret study begun in 1967 analyzing where the Vietnam war had gone awry. The 7000-page tome showed that presidents and military leaders had been profoundly deceiving the American people ever since the Truman administration and that the same mistakes were endlessly repeated. Like many policy autopsies, the report was classified and completely ignored by the White House and federal agencies that most needed to heed its lessons. The Pentagon Papers proved that politicians and their tools will brazenly con the American public to drag the nation into unnecessary wars. But that lesson vanished into the D.C. memory hole — conveniently for obsequious journalists like Post superstar Bob Woodward. Most of the media had embedded themselves for the Iraq war long before that diner. The Post buried pre-war articles questioning the Bush team’s shams on Iraq; their award-winning Pentagon correspondent Thomas Ricks complained, “There was an attitude among editors: ‘Look, we’re going to war, why do we even worry about all this contrary stuff?’” Instead, before the war started, the Post ran 27 editorials in favor of invasion and 140 front-page articles supporting the Bush administration’s case for attacking Saddam. It wasn’t just the Post. Former NBC news anchor Katie Couric revealed in 2008 that there was pressure from “the corporations who own where we work and from the government itself to really squash any kind of dissent or any kind of questioning of” the Iraq war. Supreme Court Justice Hugo Black, in his 1971 opinion on the New York Times’ right to publish the Pentagon Papers, declared: “Only a free and unrestrained press can effectively expose deception in government.” Unfortunately, the media often chooses to trumpet official lies instead of fighting them. 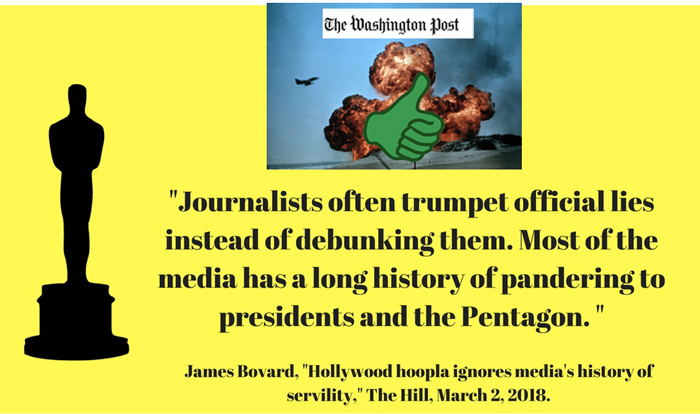 Permitting glorious tales from eight presidencies ago to absolve subsequent media kowtowing would be as foolish as forgetting the lessons of the original Pentagon Papers. 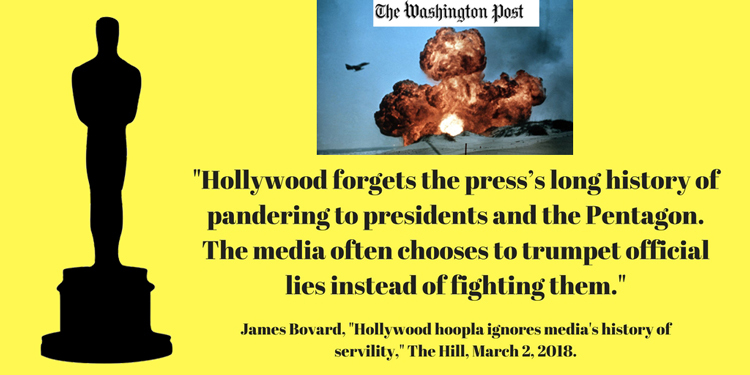 Worshipping the media is as foolish as worshiping politicians. In short, so long as the media likes you, you can’t do any wrong. Which, to be fair, is no different than anything or anybody else in life. Other people don’t charge $1 a day based on a presumption that they are delivering accurate information. Of course not. Some of us get hundreds per *hour*, but still have to carry malpractice insurance because there’s always the chance that that information WON’T be accurate…. 😉 Those “buck-a-day” guys are almost certainly worse…….